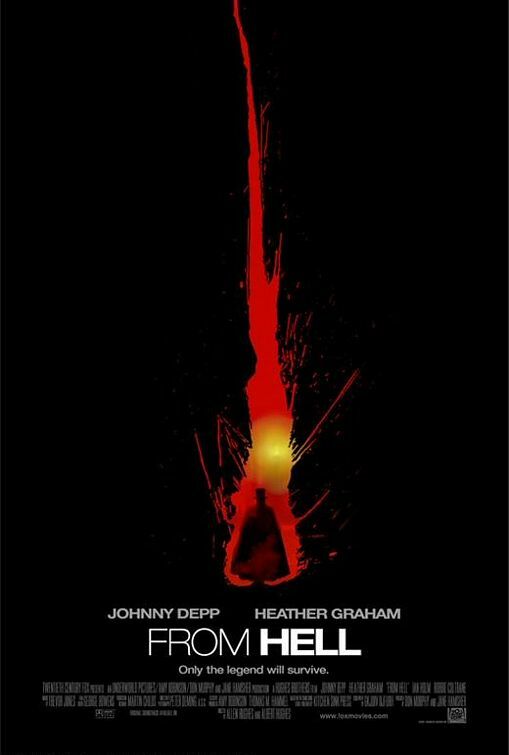 Today’s cinema adventure: From Hell, the 2001 screen adaptation of Alan Moore and Eddie Campbell’s award-winning serialized graphic novel exploring the real-life Jack the Ripper case through a fictionalized story about its investigation, starring Johnny Depp as the Scotland Yard Inspector in charge of the case. As directed by Allen and Albert Hughes, it condenses the 500-plus page original to fit a running time of less than two hours, omitting much of the book’s rich, immersive material in the process, effectively transforming the piece from an informed- if dark- historical fantasia into a pop-art horror movie with pseudo-sociopolitical overtones. Nevertheless, taken on its own merits, it’s a stylish and intelligent thriller, offering a fairly accurate (though highly speculative and sensationalistic) depiction of perhaps the most infamous true crime story of all time, as well as an excursion into the dark underbelly of Victorian London. Adapted into screenplay form by Terry Hayes and Rafael Yglesias, From Hell blends fact and fiction as it unfolds its narrative, set mostly in London’s seedy Whitechapel District in the fall of 1888. It’s a miserable, economically depressed slum, populated by rough laborers, criminals, and prostitutes- the latter of who are being savagely killed in a series of increasingly macabre and horrific murders. In charge of the investigation is Frederick Abberline, an opium-addicted police inspector with a gift for psychic visions; his prescient insights into the case bring him to suspect an even darker and more insidious motive to the crimes than is suggested by their brutality, as well as leading to his personal involvement with one of the Ripper’s potential victims. As he gets closer to the truth, he finds himself enmeshed in a dangerous web of secret intrigue, racing against time and facing powerful opposition in a desperate effort to prevent the monstrous killer from claiming more lives- including his own. The plot unfolds against a backdrop of late 19th-Century English society, offering a bleak and politically-charged vision of a world in which disrupting the illusion of propriety is a greater crime than murder; the privileged elite exist outside and above the law, orchestrating and manipulating events from behind closed doors while the impoverished masses endure an unthinkably cruel and desperate existence with little hope of escape or betterment, and even those sympathetic to their plight are powerless to help them. Moore and Campbell engaged in painstaking research in the creation of their graphic novel, meticulously incorporating the facts of the Jack the Ripper case into their multi-layered fictional retelling. That effort is reflected in the film, though in a somewhat diluted form; on the page, the historical facts are presented side by side with the story, making for an immersive experience in which the reader can participate in the process of speculative myth-making, whereas for obvious reasons this cannot be duplicated onscreen without disrupting the visual (and emotional) flow. In addition, the panoramic view of Victorian society offered by the original has been necessarily stripped down; though the filmmakers have clearly made an effort to provide as much of this background as possible, their running time dictates the removal of all but the most cogent information. An unfortunate side effect of this streamlining is that key plot points, which might have been better masked in a more comprehensive script, become painfully obvious, making the film highly predictable to savvy viewers, particularly those familiar to the true events of the Ripper case. It can be argued, however, that the film’s purpose is not to puzzle us with its mystery- which is well-known as an unsolved and probably unsolvable case- but to offer a social commentary by using its plot and its setting to parallel our modern world. To this end, the Hughes Brothers sculpt their film to highlight the disparity between the upper strata of the Victorian population and the impoverished lower classes amongst whom the Ripper’s crimes take place. The wealthy are isolated, arrogant, and dismissive of the concerns of the less fortunate, while the poor, in their struggle to survive, are greedy, opportunistic, and cruel. It’s not a pretty picture of mankind, and there are few examples of middle class decency on display- only Abberline and his Shakespeare-quoting sergeant represent a compassionate view towards humanity, and even they are characterized by a mistrustful cynicism which reflects their exposure to the harsh realities of the age. The nobility and their bureaucratic allies are portrayed as smug, self-appointed guardians of a status quo that favors their continuing prosperity, and many of them seem possessed of a sadistic streak, exhibiting an unmistakable delight in their infliction of suffering and the exercise of their power over the weak. Each and every member of the ruling class is portrayed as contemptuous of the poor, even those who seem, on the surface, to be more enlightened, and the underprivileged commoners beneath them are shown to have suppressed any noble sentiments in favor of self-preservational hostility and practical amorality. Providing illumination on this ugly portrait of mankind at its worst, the directors give us an unvarnished look at the wretched conditions of existence to which these masses are subject- the filth, the corruption, the continual struggle for inadequate food and shelter- and the opposing luxury with which their economic superiors surround themselves. From a visual standpoint, the Hughes Brothers make their objective clear from their opening shot, which pans down slowly from an austere London skyline at dusk, offering glimpses of the various strata of society through their lighted windows until it reaches the dark and squalid streets of Whitechapel, where an assortment of dehumanizing activities are plainly on view. The pair also take pains to recreate the dramatic visual atmosphere of the comic book format, reconstructing the composition of panels from the original and utilizing a color palette which conjures memories of the lurid English horror classics from the fifties and sixties- many of which share a similar setting and were clearly inspired by the lingering cultural memory of the Ripper’s reign of terror. However, although these iconic forbears were noted for reveling in an almost gleeful depiction of blood and gore, From Hell is relatively short on explicit violence, though there are certainly enough glimpses of horrific acts and their aftermath to create the impression of having witnessed a bloodbath. Similarly, despite its title (a reference to a letter sent by the real-life Ripper to taunt the police), the film is not a supernatural fright fest, though there is a not-so-subtle implication of a dark, possibly otherworldly force at work behind the killings; this is no tale of demons at large, wreaking havoc on a weak but innocent humanity, but an indictment of mankind at its basest and the depths to which it will sink in order to preserve its own selfish desires. Ultimately, From Hell aims to derive its real horror from the implications of its clearly-stated premise- that the gruesome career of Jack the Ripper is but a prelude to the larger scale horrors that await in the coming century, the tip of an iceberg formed by the clandestine machinations of the world’s tightly-knit power elite. This darkly cynical sociopolitical viewpoint is familiar to anyone familiar with Alan Moore, whose somewhat radical sensibilities are plainly displayed in such other of his works as Watchmen and V for Vendetta, as well as his contributions to the Batman series. While his leanings certainly come across in this screen adaptation, however, their effectiveness is certainly limited by its narrower focus. Where the published work is overwhelmingly centered on his postulated notion of the killings as a symptom of a far-reaching social imbalance, supported by an interwoven tapestry of peripheral events which underline and reinforce his theme, the screen version fails to bring home the significance of this element, treating it more as a necessary conceit of the plot than as the main purpose towards which that plot is geared. Though the writers and directors have clearly understood their task, and made considerable effort to stress the relevance of Moore’s allegorical subtext in their realization of his piece, they are ultimately defeated by the need to provide a Hollywood-style, story-driven thriller; the cold-hearted patrician gentry and the need-driven proletarian rabble are present, but the broad strokes with which they are painted render them clichéd, stock figures of the Grand-Guignol horror genre from which the film takes its cue, and the numerous scenes of social injustice and economic inequality come off as obligatory, the kind of standard fare usually found in dramas set in this period- and often presented with more conviction than we see here. Coupled with the aforementioned predictability of the plot, the familiarity of these elements help to make From Hell feel like something we’ve seen before. Though the film doesn’t quite live up to its potential, the actors acquit themselves admirably. Johnny Depp is shrewdly cast as Abberline, who in real life was described by his colleagues as a highly capable officer with the demeanor of a mild-mannered bank clerk, though here he is portrayed as a decidedly more unorthodox figure, somewhat dissolute and highly unorthodox in his methods; Depp provides a perfect access point for a modern viewer, bringing a highly contemporary persona into the proceedings and providing his customary intelligence and commitment to the role, and if he sometimes seems to be sleepwalking through the film, this adds an appropriate layer of detachment to a character who is, after all, a drug addict and a visionary. Heather Graham also brings a modern feel to her performance, though in this case it feels a bit less appropriate- she plays a prostitute who lives on the streets, and her level of intelligence and sensitivity seems a bit anachronistic; this is true of the portrayal of all the streetwalkers in the film, but in Graham’s case, given the conceit of her highly fictionalized role, it’s an acceptable disparity, and she succeeds in being likable and sympathetic in the midst of a cast of unpleasant characters. The two stars, however, are ultimately less memorable than the host of fine British character actors who fill the supporting roles. Particularly noteworthy are veteran character actor Ian Holm as gentleman doctor who assists Abberline in the case by providing his medical knowledge, and who may in fact possess more information than he is willing to share; and the always delightful Robbie Coltrane as the gruff but good-natured sergeant who serves as Abberline’s loyal assistant and friend. The remainder of the cast get little chance to flesh out their characters, most of which come off as little more than ciphers in service of the story, but for the most part, they perform their tasks with a relish which goes a long way towards making the world of the movie seem believable, if not particularly compelling. Despite the fact that it falls short of its considerable potential, From Hell is not a bad movie; it succeeds on a number of levels, not the least of which is providing a fairly gripping two hours of suspenseful- if unsurprising- entertainment. It takes an oft-seen scenario and presents it in a form that both pays homage to the style of its former, more traditional incarnations and refreshes it with a modern and distinctive flavor of its own. If it fails to capture the full power and ambitious scope of its source material, that is perhaps no surprise; Moore and Campbell’s creation is a complex work of art that is inherently best served by the medium in which it was first presented, and it is doubtful that any film could capture it faithfully without falling short on some level. Nevertheless, it is a brave attempt, and if nothing else, it certainly provides inspiration for viewers to seek out the graphic novel and experience its brilliance for themselves. Beyond that, it is a well-made, if ultimately ordinary, thriller, blessed with a talented cast and an impressive visual style; and for those who have an interest in Jack the Ripper and the world in which he existed, it’s a must-see, and as long as you don’t expect to learn anything new about the case (and you don’t mind seeing a long-disproved theory being put forward once again), you’ll probably find it a worthy rendering of this legendary chapter in the annals of human brutality.